Metatronia Therapy is a new healing modality but an ancient sacred resonance of the highest order. It is essentially a vibration and frequency from Archangel Metatron using his healing vibration, codings and Sacred Geometry. It is very powerful and will transform the lives of those that receive it. It is applied through healing, distantly, in person, attunements, meditation. Once you are attuned to it you are provided with all that you will need in regard to your Ascension process. 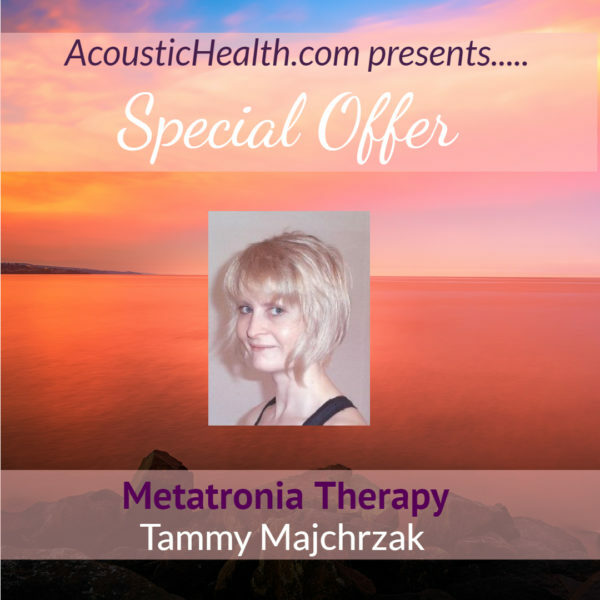 Tammy Majchrzak connected with Metatron consciously in 2010 and since then she has been working with him and the Archangel Realms, t hrough daily channellings, guidance, messages and healings to bring this healing modality to the world. The timing was crucial as we moved into 2012. There are a lot of new energies surfacing around the Universe and this healing modality is here now to bring us into balance, and to shift our consciousness and raise our vibration. We are coming into an age where illness and disease are forming and becoming part of daily life, accepted almost, as we live in stressful times, rushing around, not really connecting within ourselves and losing our true essence, our spark, the light of our Soul. Debt, worry and anxiety becoming the plague of modern society. This is about to change, the tools are here now to lift us out of this existence, so that we can truly connect with the Divine light within us and make magnificent, positive, transformational changes that will change our life. Metatronia Therapy is healing energy like no other I have felt or experienced. It is an extremely high vibration and really goes to the heart and heals, on so many levels. Archangel Metatron opens us up to this remarkable and effective healing process. The energies assist in healing on many levels but also in raising our vibration, energy, consciousness and frequency, realignment, reconnection, and new energies to move us into higher dimensions of reality. Spiritual Tools Workbook A workbook is included to assist you in understanding about expansion, grounding, energy and much more. A valuable companion to those who are embarking on the awakening process and learning about their connection to the divine light of the One. This option also includes an attunement to Metatronia Therapy as a non-active practitioner. This opens you up and connects you to the divine vibration and energy of The One Source through the connection with Metatron. This level is an introduction and is used by many for themselves and their own healing. This is not an active practitioner level. A special package will be offered in this Online Healing Retreat for those wishing to receive a Master Attunement and become a practitioner in the Metatronia Foundation of Light. Your Lightbody is already activated. Through Metatronia Therapy you become more attuned and aligned with the formation and energy of your Lightbody. No one can “turn on your lightbody” for it is already active! MT assists with much more also. Mental body, emotional body, physical body realignement and rejuvination. Rewiring of neural pathways/synapses which is due to the light transmission/frequential codings that are brought down during the healing sessions and attunements. Healing of heart, mind, body, muscles, tendons, the whole system is cleansed, the Human Vessel (body) is purified. allowing us to live in a “vessel” that is functioning at its most optimum level. Removing any doubt and fear, giving us the freedom to explore and move to where we truly need to be, to realise our life’s true soul purpose. The healing works by Metatron connecting with us. He already knows what it is we require to heal. Our life stories/history of this life and past lives are scanned, and healing begins on taking away any parts of our life story, our conditioning, our programming that no longer serves us. The healing itself is painless, very soothing and extremely relaxing. Many have said that they feel they are literally lifted up and brought back down, feeling empty and at peace and not able to find the stuff they were worried or anxious about before they have the healing. The Healing aligns your blueprint, repairing your DNA/RNA and healing the Celestial bodies/Auric Field. Metatronia Therapy brings energy that reactivates many elements within the Human Vessel and the Celestial bodies and also awakens the d ormant energy within the Pineal Gland. The DNA/RNA restructuring and the Pineal Gland reactivation brings about clearer insight, psychic skills, heightened senses and a reconnection within the whole human vessel (body) so that it returns back to its oneness state. Many report weight loss after the Metatronia Attunement. This is concerned with the energies that come through to realign and balance you. Bringing you to the optimum state of being, that you should be. This is healing on a cellular level. Reaching our very core, and allowing us to function more freely, think more openly and feel at one with the Universe and most importantly to connect with the deepest part of us, our true real soul essence. This is not just about physical healing it is about bringing us to where we truly need to be. So changes will take place, some felt immediately. A shift in energy may be felt when the healing takes place and there is a 30-day cleansing/detoxing period. This may go on for longer depending on the individual. As a Reiki Master Teacher, Tammy says she finds Metatron’s healing energy to be very different as she connects with it and brings in the healing frequency. It seems to have a much more powerful vibration. We become more aware of our Lightbody and our soul purpose. We begin to feel and look at life differently and with a deeper knowing and connection. This is more than just healing the physical Vessel/Body. Metatronia Therapy realigns you with your Soul, your true self, it catapults you on your ascension journey and uplifts your spirit. Bringing you into your Divine Awakening…Are you ready? Connect with Archangel Metatron in this specialized Online Healing Retreat that will assist you in stepping into your new Divine Body of Light. Includes the LightBody Vehicle Mechanics Workbook. The Latest Project within the Metatronia Foundation of Light. The focus being awareness of the Lightbody and Lightbody Vehicle Mechanics. Tools, Techniques, Channeling, Images and much more. Very much food for thought and a taster. T his workbook brings to the reader an expansion in consciousness. It is not based on exacts rather it gives you an opening to explore many possibilities of your connection with your very unique and divine lightbody vehicle/MerKaBaH. This workbook is very much about awareness of our Lightbody vehicle and it goes hand in hand with Ascension. You cannot have one without the other. If you enjoyed today’s program and wish to become an Active Healer for Metatronia Therapy and perform Attunements, this is the option for you. Become an active and professional MTFOL registered Metatronia Therapy Practitioner. If you enjoyed the vibration in the Healing Conversation on Metatronia Therapy, you’re invited to become an active practitioner! You’ll recieve everything in Option 1, including the 6-hour course for non-active healer, plus you’ll be activated as a Metatronia Therapy Practitioner, and be listed a practitioner in the Metatronia Foundation of Life Membership. Membership and certification will be sent after the course. Along with the Healer workbook, Q & A and application form which are required to be completed by all those taking this attunement. Attunement to the Active Practitioner Metatronia Therapy Level. This includes Membership to the Metatronia Foundation of Light (MTFOL) and your name is shown on the MTFOL Register of Active Practitioners. Metatronia Therapy is an approved and accredited training provider and so only active dedicated practitioners are shown on the register. Tammy’s readings are based on your unique divine soul coding to further assist you in attuning with this energy. They are based on what you need to know as opposed to what you want to know. They are very much geared to assist you on your Ascension and awakening journey. Spirit Guide and other information can come through at the time of the reading. These are given by email. Center of the Earth – a journey to the center of the earth – taking yourself out of you to a whole new spatial and dimensional awareness. Divine Intervention – trusting and opening and believing in the One. Golden Pyramid – A magical journey to the sacred lands and energies around the Pyramids. Thoth may visit during this meditation! Golden Sphere – Taking you to another dimension within yourself. Higher states of awareness and connection, feeling and sensing. Healing Orb – a healing tool – very empowering and very nurturing. Love Frequency – feel the love from within you – releasing and allowing you to feel more deeply within yourself. Great release and unburdening, lightening and expansion. Meet your spirit guide – Take yourself to a sacred place where you can meet those who are assisting you on this journey. Loved ones may also visit during this sacred time within yourself. Metatron – Be Open to Receive – a great connective meditation. Empowering you, opening and assisting in your awakening process. This is a very powerful and releasing meditation. Connecting you to the divine energy of the One, through Metatron’s vibration and light coding. Planetary Energy Alignment – Spend time among the planets and soak up the elixir that they bring to you. Divine planetary codings and balancing vibrations. Spirit Temple Healing – Sacred time in a sacred place and space that you can come back to and visit at any time. This is the final attunement. Master Healer/Attuner enables you to attune others. You must become an active practitioner before you can be considered for Master Attuner. There are two levels of Master Attuner. The first is as a Master but for your own ascension and awakening process. Not to work as an active Master Practitioner. When applying for Master Attunement please inform the attuner as to what level you wish to be attuned. There is space to annotate this on the Master Q&A form. The Second level is Active Master Attuner Practitioner which means you are able to work in an active practitioner capacity and attune others. For this you must submit 6 case studies/feedback from healing sessions (in person and/or distant healing sessions) you have carried out at Active healer level and be a member of the MTFOL. The MTFOL train official Metatronia Therapy workshop Facilitators. If you are interested in this then you must be at Master Attuner level. Not everyone is suited to this and so there is process to ascertain your suitability for this role as Facilitator. An application form is the first form to complete to assess your suitability to become attuned. Then a Q&A accompanies the workbook, which requires completion and sending back to your Attuner before attunement can commence. The completed Q&A confirms you have fully read through and understood the modules within the workbook prior to your Attunement process. Metatronia energy works on intuition/channelled instructions/information from Metatron. For the first month after attunement is a time of self-healing, balancing of left/right brain hemispheres, and an overall balancing and restructuring so that you have a firm base and vessel to carry this energy. After the first month you are then able to heal others although some are finding they are able to heal before the 30 days. Its best to go with how you feel within. If you are ready you will know. The workbook issued goes into more detail and the MTFOL are here to support all Practitioners if it is required after the attunement process. The majority of the work of Metatronia Therapy is channelled from Archangel Metatron. He will be your guide and your helper from the moment you are attuned. You will be receiving a very powerful healing energy that is breathtaking and you will learn to work with the healing energy in different ways. Although the base teachings given in the workbook remain the same across the board for everyone, your own unique journey will begin with Metatron. For some that have already been attuned to Metatronia Therapy it is clear that Metatron will work with us differently according to the energies we can hold and the work we are to do. The Attunements are experienced uniquely by each individual Being. Our DNA is unique, our connection is unique, our own journey is unique. No one human being carries the same coding as another, not from a 3D perspective. The attunements are not just about healing yourself and others. The attunements open you up to many different dimensions. Working through the Ego, letting go, unburdening, healing, but so much more. People are experiencing it in their own unique way. It is very intriguing. You cannot view this healing vibration from a linear mind perspective as it goes above and beyond any expectations we may have or have had with other healing systems. This is very much about total surrender to the One Light and divine essence and truth within ourselves. This healing does not work through the ego state/linear mind. It has no place within this vibration. This is not like Reiki. It is a completely different, unique energy, and is a finer and more powerful/transformational frequency. Please email me if you would like instruction regarding Distant Attunements. It is one of the most beautiful energies I have ever worked with. It is, although magnificently transformation and powerful, a very loving and extremely direct vibration that will move you mountains within and outside of yourself. HEALER This is the first level attunement. You will receive energies and frequencies to heal yourself and then be able to go on and heal others. The first attunement level is often felt as the more intense frequency as the sacred geometric codings align with your frequency and begin to work their magic. This first level is where the deep connection with Metatron occurs. Some feel overwhelmed with the connection, others feel different, again it depends on your unique DNA coding and although this is healing energy, it does so very much more. Not only healing the physical body but the Celestial, Aura, Chakras, Lightbody, Physical, mental, spiritual and emotional bodies are balanced and healed also. Many changes begin to occur in your life. You will work through the mental body blockages, conditioning,, behavior, rigidity, as the expansion occurs you will grown in light and begin to connect to your true Soul’s light and One Source energy. At Master level you will be shown how to attune others to Metatronia Therapy and be able to hold a higher vibration. (You must have done the Healer Attunement before this one). This completes the Attunement process, there being only two attunements with regards to Healing. You must have been attuned to Active Healer initially and give a period of 3 months minimum before you can take the Master Attunement. Please note when booking appointment do not make for same day as I need to schedule you in. Please allow minimum of 4 days before appointment. If this date is not available then I will email you. Please make sure you choose the correct attunement button, active or non active. Your official certificates are issued after attunement.